Forests burned by two wildfires. 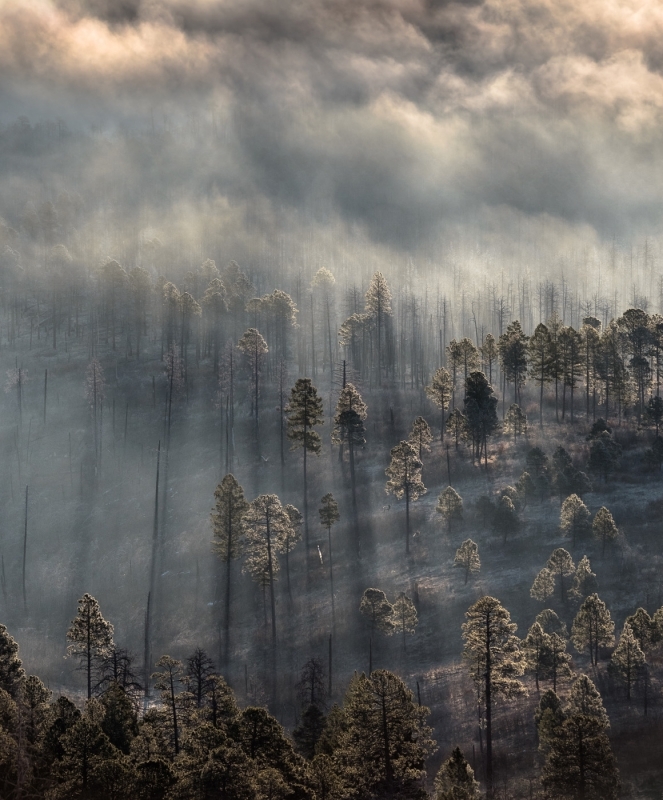 This is the charred Santa Fe National Forest in the Jemez Mountains of Northern New Mexico, on a foggy morning. Here, two major wildfires scorched the land - Â­ the Cerro Grande Fire in 2000 and the Las Conchas Fire in 2011. The small trees springing up from the ground on the right show the area of the Cerro Grande Fire in its recovery stages. The charred forests in the back and left show where the Las Conchas Fire approached and burned parts of the same area that the Cerro Grande Fire had already decimated. There was no rest for the fireÂ­weary Jemez Mountains, and it will take decades for the forests to grow back.